Like soul food? Interested? Want the very best? Read on. For a too short time a few years ago, Tanya Holland worked at Cooking by the Book. She was one of the culinary advisors central to our hands-on culinary program. Here, corporate groups come into our kitchen, divide into groups, and each group has a culinary advisor to help them with one dish of a three-course meal. Their cooking finished, the corporate folks retire to the dining room to eat. We clean up the kitchen. As an advisor, Tanya did not do the cooking for her team. The team, the people in suits did — we do let them take off their ties. But she was there to help, answer questions and provide insurance. We want our guests to have exceptional food. That means our advisors have to be both accomplished chefs and articulate advocates for cooking techniques and insights. We loved how Tanya could help a team work through a complicated dish to culinary success. She obviously has powerful communications skills and culinary insights. We loved that. We hated when she said she was off to California. We wished her well, though, expecting success. She was venturing to San Francisco we were told, a bistro in her future offering steak frites and bouillabaisse and all the classics she learned cooking in France. She does happen to know the foods of North Africa and the Caribbean and the American South as well. That turned out to be very important. Maybe all that knowledge just slowed her down. She did not get to San Francisco. Close, but she stopped on the other side of the Bay. In West Oakland, in an industrial area with neighbors like a forklift company and an auto repair shop, she opened a soul food kitchen. If you ask how it’s going, just look at the lines out the door. She’s got a second restaurant now very close by. She may never get to San Francisco, but then she really doesn’t need too. If you combine Tanya’s talent, a soul food background, and California ingredients you get a recipe portfolio of distinction. After her husband, Tanya’s abiding love is for food. The recipes here are studded with her adornments. Little extras abound. Little tips and ideas that take each dish to another level. For example, to make the Strawberry Lemonade just a bit extra sour, it is made with lemon-infused sugar that has been prepared the day before. The result? You don’t get that rush of pure sugar sweetness you would be adding granulated sugar right at the end. Instead there is an added level of lemon tartness that snuggles in with the strawberry flavor — look for the recipe in the coming week! 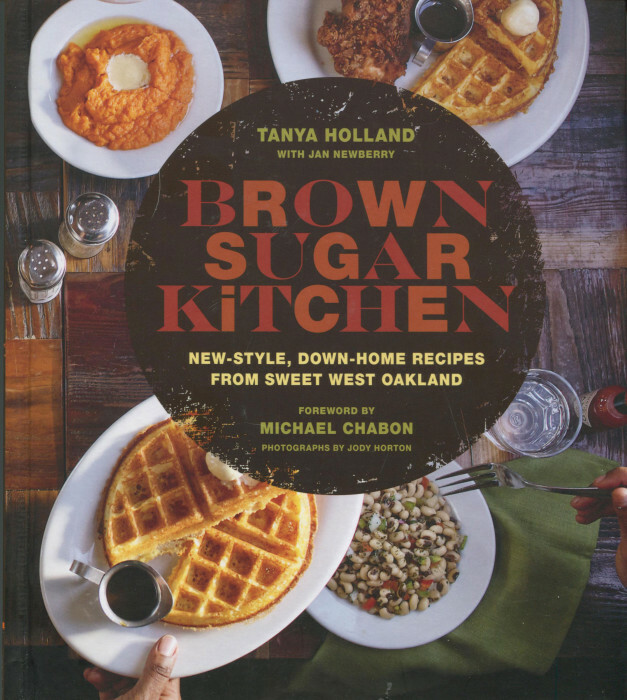 Brown Sugar Kitchen is carefully, artfully written. If you know soul food, you will be on familiar turf. If you don’t, you are about to be inducted into a culinary world you’ll always relish. And, if you are ever in West Oakland and see a forklift place, do look down the block. That line of people isn’t for the forklifts or for tires. It’s for food, great soul food from an expert chef.